The California poppy is a wildflower that is also the California state flower. I remember first becoming aware of its significance when I was six years old. When I first discovered them, I wanted to pick the flowers so badly. But my mom warned me that it was a special flower that shouldn't be picked if it's within a certain distance from the roadside, because it is the symbol of the state of California. She also wisely explained to me that after I picked one, the flower wouldn't last long and it was better to leave it growing where it was. It was one of the first of many flowers I learned how to enjoy without picking it and taking it home with me. Now, with my digital camera (or camera-phone) I can "pick" flowers in a different way. I can take the image of a flower home with me and leave the lovely flower behind growing where I found it. 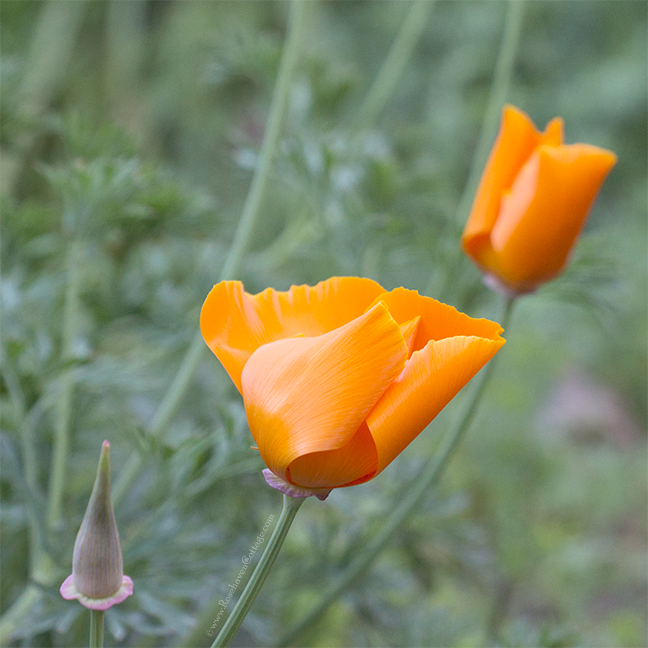 This is particularly important when it comes to delicate wildflowers like the California poppy. Thank you so very much, Kelly! That colour is absolutely stunning!! What a beautiful state flower. The colour belies it's fragility. Oh wow, Carolyn! The Western Red Lily is your province's flower? How fantastic!!!! That is one gorgeous flower. Does it grow as a wildflower like our state flower does?